This winter the Carleton University Art Gallery is featuring three exhibits centred around themes that underline the connection of the university campus to the wider community. Large paintings with bold colours make up a retrospective called Uprising: The Power of Mother Earth and it features paintings by the prominent Metis artist Christi Belcourt done over the past few decades. It also includes works done more recently with Isaac Murdoch. The artists say the paintings bring light to a holistic social practice, combining both Indigenous art and activism. Striking photographs are paired with interesting research done by Kahente Horn-Miller are featured in the exhibit, My Mom, Kahntinetha Horn, the ‘Military Mohawk Princess,’ which also shares the theme of social activism. Prof. Kahente Horn-Miller and Kahntinetha Horn will be in conversation at the Carleton University Art Gallery, Feb. 11 at 7 p.m. For more information please see cuag.ca). Interactive audio and video elements make up Re: Working Together / Re: Travailler Ensemble, curated by Heather Anderson and Marie-Hélène Leblanc. A tip: If you get hungry looking at pictures of brightly coloured wrapped chocolate bars in this show created by one of the artists and a group of elementary school children, you can purchase one of the same chocolate bars at the front desk. Sandra Dyck, CUAG’s director, says the latest exhibitions are an example of the gallery’s efforts to link the campus and the city. “CUAG is the only university art gallery in Ottawa,” Dyck said in an email interview. “Through offering dynamic and diverse exhibition, public and publication programs, we bring people together to explore and activate the ideas that shape contemporary society,” she said. “There are university art galleries all across Canada and they play a distinct role in terms of serving civic and campus communities, so we were interested in working together,” curator Heather Anderson said. 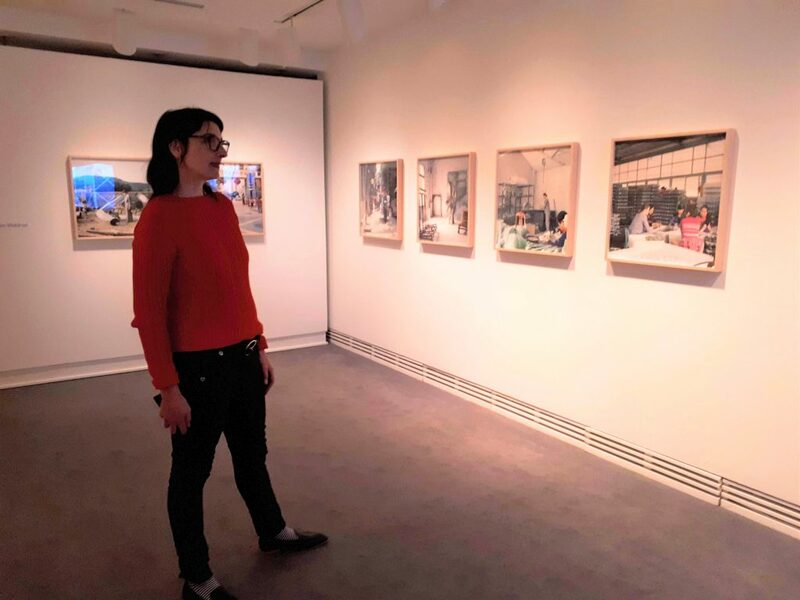 As a curator and adjunct art history professor, Anderson says her role is to organize exhibitions and conduct research while playing a pedagogical role in supporting classes and students. Kahente Horn-Miller’s exhibit, My Mom, Kahntinetha Horn, the “Military Mohawk Princess” tells the story of her mother, who was an Indigenous activist and a fashion model in the 1960s. Horn-Miller said her mother used her beauty, which is evident in the striking photographs of her in the exhibit, as a way to get people to listen to her activism. Kahente Horn-Miller is a professor of Indigenous and Canadian studies at Carleton. She said she worked on this exhibit with her mother and her sisters. “A lot of the information and the insight comes out of our life experiences. So collectively we worked on this and I happened to be the one who wrote it up. “For me, as an Indigenous person and educator I am constantly working at bringing Indigenous pedagogy into my classroom,” Horn-Miller said. She said the location of CUAG and the gallery’s exhibits give the opportunity for educators to teach in different ways. “I find that having access to the gallery and having my students go there and experience it is in line in some ways with Indigenous pedagogy because we are not originally a written people, we are very much visual learners…when you think of art it’s about visual storytelling,” she said. Anderson said the idea of the civic community, like the gallery, can become a kind of ambassador or beacon and welcoming space for people who don’t attend Carleton. She said it can also build a relationship between the campus and the civic community. The winter exhibitions will run from Jan. 21 to April 28. Something cannot centre around: it’s either at the centre or at the circumference. Nice job, though.